When in Venice...Ride a Gondola! | Travel? Yes Please! It poured rain almost the whole day I was in Venice. I stepped off the water taxi into foul smelling lagoon water almost half way up to my knees. “If the rain doesn’t let up, the gondola will be cancelled,” our tour leader informed us. I was so worried that the one thing I was most looking to forward to in Venice might not happen (I think I might have almost cried). I mean, how can you go to Venice and not go on a gondola! And it’s not like I would be back any time soon, if ever. I walked around all day, cool showers pouring down over me, wishing, hoping, crossing my fingers that the rain would stop. Luckily the downpour stopped just before our scheduled time. What a relief! Off I went on a romantic ride down the canals, just me and five others, while the gondolier serenaded us with tales told into his cell phone as he paddled us along. No joke-he talked on his phone the whole time. Is it weird I was disappointed that he wasn’t wearing a striped shirt and ribboned hat? 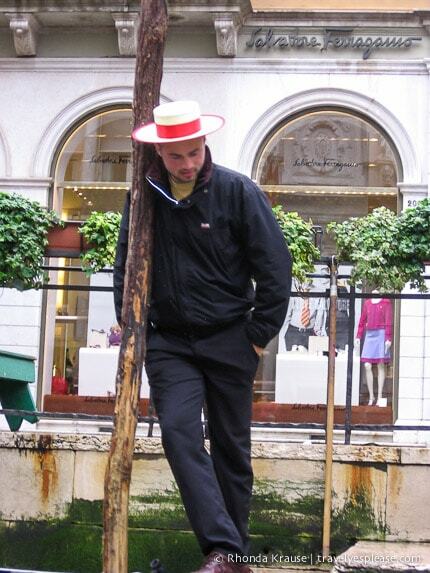 This guy is more what I was expecting as a gondolier. I bet he sang too. Although my gondola ride wasn’t quite what I had envisioned, it was still the perfect way to end my day in Venice. Gliding down the water was so tranquil and serene, affording me a different angle from which to view this unique city. If I was ridiculously rich, I would have rode around in one all day. I was captivated the entire time! This post is brought to you courtesy of Mother Nature, who co-operated just long enough for me to have my perfect Venetian moment! The “official” rate for a 40 minute gondola ride, up to six people, is 80 euros. Each additional 20 minutes costs another 40 euros. After 7:00 pm, the price goes up to 100 euros for 40 minutes and 50 euros for an additional 20 minutes. 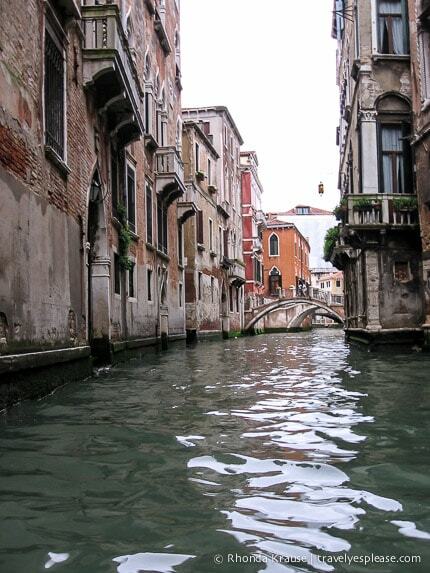 Don’t be afraid to shop around (you can find gondolas all over the city). 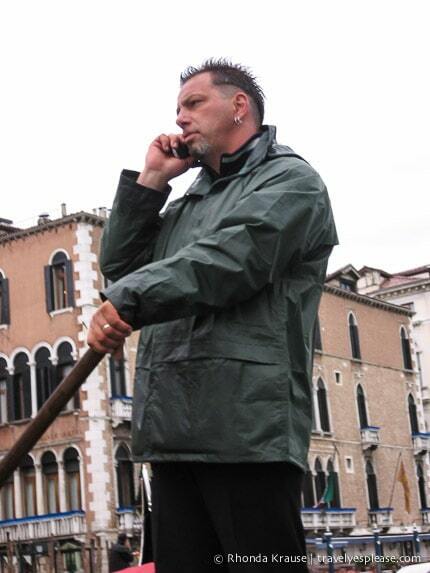 Some gondoliers will quote you much higher than the official rate, especially at Piazza San Marco. Make sure you are clear on what you are getting for your money. Consider the sites you want to see, the length of ride you want to have and the amount you are willing to pay. Some gondolas are fancier and better maintained than others, so that might factor into your decision as well. If you want your gondolier to sing, of course you will have to pay extra!